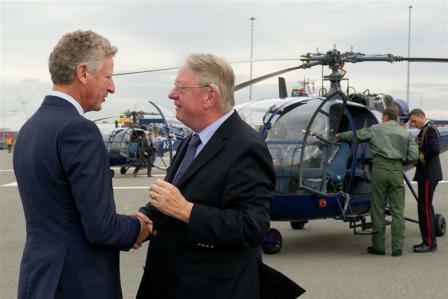 Benelux Defence Cooperation: Evolution or Revolution? On 18 April 2012, the Ministries of Defence of the three Benelux countries (Belgium, Netherlands and Luxembourg) signed the Benelux Declaration on cooperation in the field of defense. The aims of this commitment were to join forces, to share costs, as well as to increase output of capabilities. One year later, it is the time for a first assessment. For this occasion, the Clingendael Institute and the Egmont Institute organised a seminar entitled “Benelux Defence Cooperation: Evolution or Revolution?” which was held on Tuesday 9 April. Three speakers from the Ministry of Defence of each Benelux country were invited to share their views: Auke Venema, Director International Military Cooperation (Netherlands Ministry of Defence); Lt-Gen. Guido Andries, Assistant Chief of Staff for Strategic Affairs (Belgian Ministry of Defence) and Lt-Col. Patrick Fautsch, Head Plans and Policy (Luxembourg Ministry of Defence). Four guideline questions were asked: What have been achieved so far? What did we learn? What has happened beyond the Benelux cluster? Is the political support from national Parliaments sufficient? Regarding the general problematic, evolution or revolution, the three national representatives agreed to answer: evolution. Indeed, they pointed out that cooperation in the field of defense had started decades ago. The 2012 Declaration represents more a new development in the long-standing cooperation than a fully-fledged new agreement. Mr Venema, Lt-Gen. Andries and Lt-Col. Fautsh highlighted some successful initiatives such as the creation of a training school or the setting up of a joint helicopter command. However, the cooperation needs to be furthered in order to be fully effective. The Belgian speaker pointed out two main obstacles. One is related to the question of the loss of sovereignty for each participating country, while all of them want to keep their autonomy to realise their ambitions. Similarly, the Belgian representative put forward a concern about the protection of national economic industrial interests. Nevertheless, one of the main weaknesses highlighted during the discussion was the lack of real political will in Belgium, the Netherlands and Luxembourg. This cooperation is still in construction. For example, there is no common structure to handle each contingent, neither a real planning process. It seems to be too early to draw up a report, as the Benelux Defense Cooperation is still a work in progress. As Lt-Gen. Andries said “This is not an option; it is the only option for Belgium”. Indeed, the main aspect of this cooperation is to fill the gap between capability needs and available budgets. These three “small” countries need each other to play a role in security at the international level. What about the Benelux cluster’s engagement within the EU and NATO? During the seminar, the audience raised questions regarding the openness of the Benelux cooperation and its relations with other clusters. They also wondered about the utility of developing a series of clusters of cooperation amongst EU countries, in a context where the EU is trying to construct a strong Common Security and Defence Policy (CSDP). Indeed, the Benelux cluster is not the only one existing, and in the panelists’ views it does not plan to free-ride. The cooperation with the other clusters is essential. The three countries recalled their close relations to other partners such as Germany and France in particular. They stressed that achieving defense cooperation between 27 Member States seems impossible, if already it is difficult to do it with three countries. Finally, concerning both the EU and NATO, the discussion focused of the importance for the EU to play an overall coordination role. According to the participants, the regional clusters should not replace European cooperation but reinforce and extend it. The European Council on Defence of December 2013 will have to deal with this exact issue coordination between the European level and regional clusters. A new function could be attributed to the European Defence Agency. This entry was posted on 10/04/2013 by ISIS Europe in Conferences, Lorène-Fara Andrianarijaona and tagged Benelux, EDA, EU, EU Crisis Management, Industry, Research and Innovation.